This simple pattern yields a larger size rag, if you would like a slightly smaller rag you can try going down a hook size. 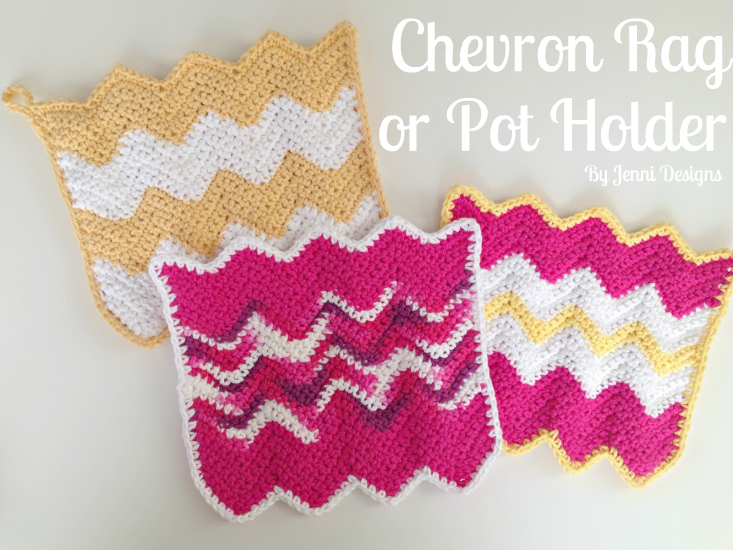 The pattern is written for the Yellow & White Chevron design in the above photo, feel free to change up the color changes how you wish though. If you would like to add a some texture to your rag, work in the BLO for rows 2-20. Below is an example rag worked in the Back Loop Only (and the border was also left off). -Stitches placed between these brackets [ ] indicate a group of stitches to all be working into the same space. Gauge: 4 sc = approx. 1"
Fasten off and join new color with sl st & ch 1. 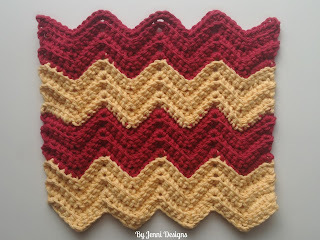 For a pot holder: Fasten off, make your 2nd rag. When the 2nd rag is complete, hold together the two rags and work the edge below working through both rags as you go. For a rag: Do not fasten off, continue below with the edge (or you can leave the edge off if you like). Sc around the entire edge of the rag. At each corner/point work the following: [sc, ch 2, sc]. After you have worked all the way around the rag/potholder if you would like a loop for hanging work the following into the last sp: [ch 8, sl st] then join to the first sc you made for the edging.